You can enjoy earning interest on this account as well as no monthly service charges when you maintain a balance of at least $1000.00. Your monthly statement will include images of your checks, just another benefit of the Interest Earning Checking Account. Seniors, 60 and over, can really get excited about interest earning checking accounts. There are no monthly service charges regardless of the balance. Get your interest earning checking account started today with as little as $25.00. Enjoy no monthly service charges regardless of the balance simply by opening a Free Checking Account with as little as $25.00. Save time and money when you use your Fairfield Federal debit card. You will write fewer checks and there are NO FEES! It's easy to make purchases or get cash at any of the numerous Fairfield Federal ATMs without fees. Apply for your debit card today! An overdraft occurs when you do not have enough money in your account to cover your withdrawal. Under that Service we pay an overdraft at our discretion rather than return a check or an Automatic payment. We would decline an ATM or debit card transaction, unless you opt-in. 2. Sweep Service. You can also request us to link your checking account to your savings account to pay any type of overdraft. The Sweep Service may be less expensive than our ODP Service. To learn more, ask us about our Sweep Service. 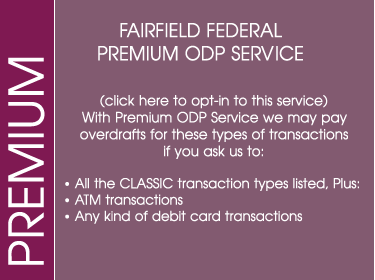 What are the Overdraft Services that Fairfield Federal offers? UNLESS YOU LET US KNOW AND OPT IN. **This notice is in the form required by the Federal Reserve Board. This disclosure is related to checking accounts established by natural persons primarily for personal, family, or household purposes; it does not relate to business checking accounts. If two or more people jointly own an account, we are required to treat the affirmative consent of any one of the joint owners as binding all owners of the account. Also, we are required to treat a revocation of affirmative consent by any one of the joint owners as binding all owners of the account. 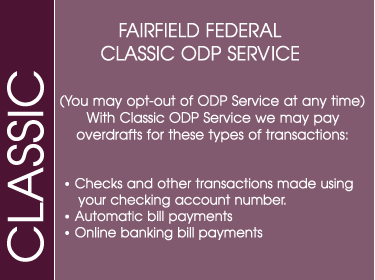 Please see our complete information about our Classic and Premium ODP Services. To report loss or theft of your debit card you can call 1-800-528-2273 24 hours a day or our local office (M-F 8:30- 5:00, Sat 8:30 - Noon) at 740-653-3863 or 800-650-0987. Your card will be blocked from further use. Please contact our local office for a new card and any questions you may have.